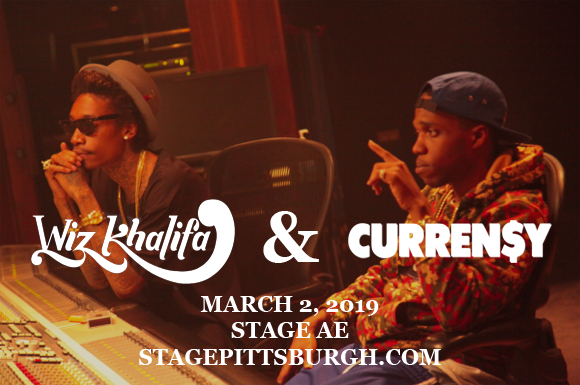 Wiz Khalifa has got deep into the 10 Year Challenge, bringing back '2009' vibes on his co-headlining tour with the Hot Spitta himself, Curren$y, coming to Stage AE on Saturday 2nd March 2019! The hip hop duo proved to be a low-key classic combo in-the-making a decade ago, turning heads with their joint 2009 mixtape, How Fly, and now they're taking it one better with a seriously fire new album on the way and hype new tour to match! Wiz Khalifa started making waves in the hip hop scene in 2005 with the release of his first mixtape, Prince of the City: Welcome to Pistolvania. The following year, he released his debut album, Show and Prove, which led to a major-label deal with Warner Bros. Records in 2007. His second album, Deal or No Deal, released in 2009, brought him further success, launching the single "Say Yeah", which reached number 25 on the Billboard Rhythmic Top 40 music chart and number 20 on Billboard's Hot Rap Tracks. Khalifa's mainstream breakthrough was "Black and Yellow", his Atlantic Records debut from the album Rolling Papers (2011), which peaked at number one on the Billboard Hot 100. His next number one single was "See You Again" ft Charlie Puth, a tribute for actor Paul Walker from the soundtrack of the film Furious 7, which charted at the top position on the Billboard Hot 100 for 12 non-consecutive weeks. Rolling Papers II, his most recent album and the sequel to 2011's Rolling Papers, was released in 2018 and features guest appearances from Gucci Mane, Swae Lee, Ty Dolla Sign, PartyNextDoor, Bone Thugs-n-Harmony and Snoop Dogg, among others.